Mike Dines and Matthew Worley (eds.). 2016. The Aesthetic of our Anger: Anarcho-punk, Politics and Music. Minor Compositions / Autonomedia: Williamsburg, Brooklyn. Punk is one of the most fiercely debated post-war subcultures. Despite the attention surrounding the movement’s origins, analyses of punk have been drawn predominantly from a now well-trodden historical narrative. This simplification of punk’s histories erases its breadth and vibrancy, leaving out bands from Crass to The Subhumans who took the call for anarchy in the UK seriously. Disillusioned by the commercialization of punk, the anarcho-punk scene fought against dependence on large record labels. Anarcho-punk re-ignited the punk ethos, including a return to an ‘anyone-can-do-it’ culture of music production and performance. Anarcho-punk encouraged focused political debate and self-organised subversive activities, from a heightened awareness to issues of personal freedom and animal rights to the development of local cooperatives where musicians, artists and like-minded people could meet. The anarcho-punk movement helped to reignite a serious anarchist movement in the UK and inspired actions challenging the Thatcher-Reagan axis. 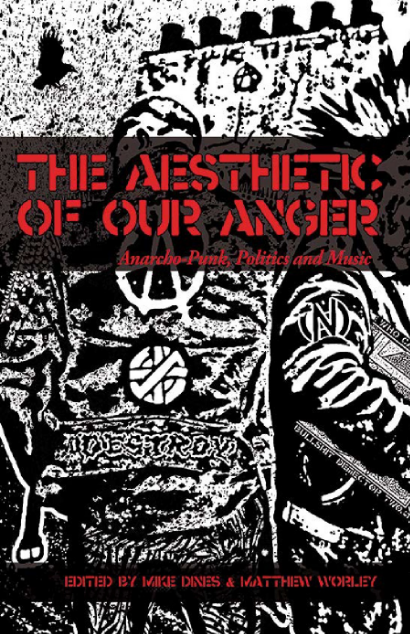 The Aesthetic of our Anger explores the development of the anarcho-punk scene from the late 1970s, raising questions over the origins of the scene, its form, structure and cultural significance, examining how anarcho-punk moved away from using ‘anarchy’ as mere connotation and shock value towards an approach that served to make punk a threat again. Contributors: George McKay, David Soloman, Russ Bestley, Ana Raposo, Helen Reddington, Rich Cross, Matt Grimes, Pete Webb, Michael Murphy, Alistair Gordon, Mike Dines, Pete Dale, Steve Ignorant, and The Free Association. More information will be available from the Autonomedia site as the publication date nears. Available now from Active Distribution and Situation Press. 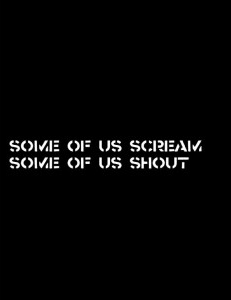 Some of Us Scream, Some of Us Shout: Myths, Folklore and Epic Tales of the Anarcho is the second in the Tales From the Punkside series. Whereas the self-titled first volume encompassed the wider punk scene, Some of Us Scream… brings together the stories, the artwork and the inspiration of the anarcho-punk scene from the 1980s to the present day. 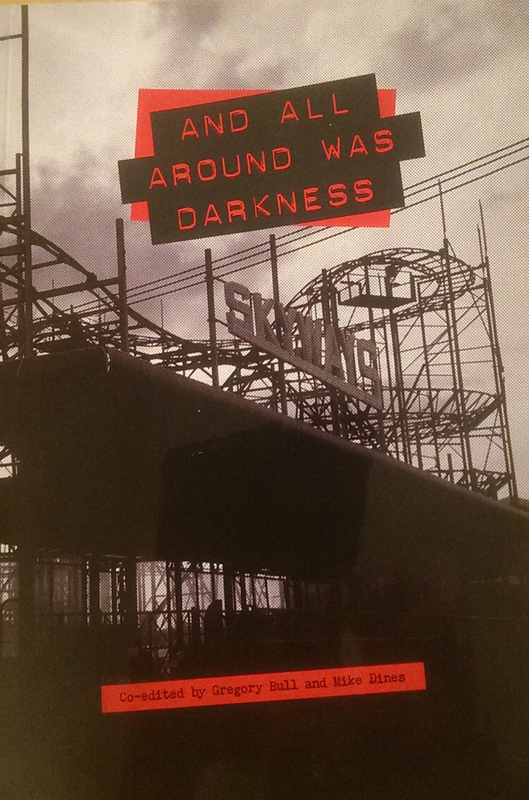 A new collection of reminiscences, recollections and stories from the first wave of anarcho-punk, co-edited by Greg Bull and Mickey ‘Penguin’, has just been published. As well as new and original written contributions, the collection features artwork, posters, handouts, flyers, tickets, lyric sheets and more besides from the 1980s wave of anarcho-punk. More details from the Not Just Bits of Paper Facebook page. There’s an online preview available with the listing on Amazon; and the book is also now available from Situation Press. “We have our own words, scrawled on bits of paper smudged with some grimey hope. Angry chords waver out from the broken cassette-players – and every now and again a curious prisoner comes out for a look and never returns.” Tony Drayton. A series of recollections, memories, imagined dreams perhaps from the collective memories of those who lived through the punk and anarcho-punk years. Tales recalled of times past and a glorious tribute to the bands and the crowds who made the 1980’s so special for so many of us. Not Just Bits of Paper is available to buy online from Situation Press (the publishers of The Truth of Revolution, Brother). To make available the full-text of the conference paper that I gave at the No Future? punk conference back in 2001, I’ve republished an archive web page of mine (from a putative anarcho-punk history web site that I worked up a few years ago). To cite the original conference presentation: Rich Cross, 2001. ‘Yes that’s right, punk is dead: Crass and the anarcho-punk critique’. Paper given at the No Future conference, University of Wolverhampton, 21 September. To cite this online version of the original presentation: Rich Cross, 2001. ‘Yes that’s right, punk is dead: Crass and the anarcho-punk critique’. Paper given at the No Future conference, University of Wolverhampton, 21 September, [available online], The Hippies Now Wear Black, http://urko.org.uk/hnwb/index.html (Accessed on access date). ABSTRACT: As McLaren conjured up the myth of the Pistols’ “rock’n’roll swindle” he urged punks to “call all hippies boring old farts and set light to them.” In 1978, the release of The Feeding of the 5000 by the band Crass had signalled the emergence of a current within punk equipped with a more complex and subtle understanding of the hippy era. Anarchist, feminist and (initially at least) pacifist, anarcho-punk began as a critique of punk ‘as it had gone before’ and a celebration of punk ‘as it was always supposed to have been’. With Crass at its centre, anarcho-punk evolved into a distinct sub-culture of music, bands, labels and fanzines, organised by a network of politically mobilised activists fiercely protective of their own autonomy and anti-commercial practice. Crass’s own gigs were a testament to the aesthetic and political distinctions of anarcho-punk – with shows combining poetry, film and banner art alongside the relentless agit-punk music. Crass’s critique of punk found its own reflection in the hostile reaction of other sections of the movement, which rejected anarcho-punk’s claims of legitimacy outright. This paper re-assesses the political, musical, artistic and cultural significance of Crass and the movement they inspired, and describes how anarcho-punk’s awkward relationship with ‘mainstream’ punk rock might best be understood. Access the full-text of the paper (there were no slides or other visuals). The conference web site was taken offline following the event, but an archive of abstracts and other information can still be accessed through the Web Archive version of the site. Many of the ideas explored in the conference paper were later included in an article in Socialist History journal in 2004, the full-text of which is also now available on this blog. As and when the Punk Scholars’ Network sets up a webspace to host slides, papers or audio-visual recordings from its events, I’ll replicate this there, but, in the meantime, the slides from my own presentation at the No Sir, I Won’t conference, organised by the Punk Scholars’ Network and held at Oxford Brookes University on 28 June 2013, are now available on this blog. There’s no full transcript of the presentation (I wasn’t reading from a fixed script, and no audio recording was made), but along with the presentation slides (in .pdf) are some brief notes (also in .pdf) which summarise the key ideas I was attempting to speak about on each slide. Steve Ignorant (with Steve Pottinger). The Rest is Propaganda. London: Southern Records, 2010. Steve Ignorant, one of the founder members of the anarchist punk band Crass, wrote, recorded, toured and performed with the band throughout the eight intense years of its existence in the turbulent times of early Thatcherism. Although the role of singer was shared amongst many of the musicians in the band, Ignorant’s signature vocal style did so much to define Crass’s unmistakable and innovative (though since much copied) early sound. More than twenty-five years on from the winding up of that band, Ignorant has authored an autobiography recounting his life before, during and after his time as a member of Crass. The result is an engaging and revealing read, offering numerous fresh insights into the ‘Crass story’, and a very personal coming-of-age tale which brings alive the era of Ignorant’s own childhood and adolescence. Throughout the band’s life (and in the quarter-century since) Crass were routinely labelled as ‘middle-class hippies’; as refugees from the counter-culture of an earlier era; and as privileged interlopers in the punk arena. Ignorant’s life story punches holes through those perpetual allegations. He describes his childhood in Dagenham and his sometimes troubled family life; the stultifying atmosphere which surrounded him; and the debilitating lack of aspiration which appeared to imprison and limit so many of those in his immediate world. The early 1970s in the UK, as seen through young Ignorant’s eyes, is a recognisably grim and constricting place in which the arrival of something as culturally challenging as ‘punk rock’ is long overdue. The story of how his life experiences led Ignorant to discover Dial House and to forge a long-term alliance with Penny Rimbaud, creating the persona of ‘Steve Ignorant’ in the process, makes for some compelling reading. There is an honest sense of self-effacement as Ignorant recounts how he was swept up in the tidal wave which surrounded Crass and which swept them into the limelight. He does not attempt to downplay his sense of unconstrained excitement at the way that the world was opening up to him personally throughout this. Ignorant comes across as a sincere, committed and honourable bloke. It is hard to overlook, however, how much Ignorant’s current concern to justify his actions in taking Crass songs out on tour (and his frustrations with the conflict amongst ex-members over the re-releasing of the band’s back catalogue on CD) shape his account of the group’s work and worth. It’s safe to speculate that, had this book been written 10-15 years ago, some of the arguments put forward here, about the practice of anarcho-punk in particular, might have been somewhat different. The title of Ignorant’s book comes from the mouth of the anti-hero of Alan Sillitoe’s classic ‘kitchen-sink’ tale Saturday Night and Sunday Morning. Factory worker Arthur Seaton declares, in his defiance to the world: ‘I’m out for a good time – all the rest is propaganda’. This choice is revealing, emphasising how far Ignorant is keen to restyle his former self as an ‘angry young man’ rather than as a strident, furrowed-browed anarchist. In that respect, The Rest is Propaganda is a very different sort of autobiography to that penned by Crass co-founder Rimbaud in the late 1990s. While Rimbaud is gloriously unrepentant about the ambitions of anarcho-punk, Ignorant is far more circumspect. Indeed, Ignorant is keen to set some distance between his account and the narrowly ‘heroic’ history of the band that he believes others have constructed. One of the things which Shibboleth and Propaganda share is a sense of the relentless intensity of Crass’s work – as the band’s popularity grew it risked becoming an all-consuming commitment. Ignorant began to resent this enforced selflessness and became determined to reassert his own personal priorities after Crass finished. For several years now, he has become something of a ‘revisionist’ historian of anarcho-punk. Ignorant is keen to stress the multiple shortcomings of the do-it-yourself (DIY) ethic, highlighting the chasm which could so often separate the aim from the reality. He recounts numerous instances of shambolic gigs, incompetent event organisers and miserable touring experiences. This might challenge an over-romantic, sanitised and problem-free history of punk DIY, but there is a real imbalance here. It is a shame that Ignorant struggles to recall an equal number of successful examples of collaborative anarchist effort; while the memories of bad food, broken promises and chaotic delivery loom so large. Ignorant has the least time for what he sees as the ‘wilfully restrictive’ internal culture of anarcho-punk and its reluctance to celebrate the idea of good, honest ‘fun’ (something that Ignorant has been anxious to reprioritise in his post-Crass life). By definition, autobiography can only provide glimpses of the wider world through a personal prism, but one of the most striking things about Propaganda is just how little politics features: both that of the political context of the time, and of the anarchist response to it. The focus is on Ignorant’s input into ‘Crass the band’ (the next tour, the next release) rather than on anarcho-punk ‘the movement’. In large part this reflects Ignorant’s interest in representing himself as that discontented and rebellious young man rather than as an anarchist militant with a Big A. This omission is frustrating and risks devaluing the political contribution which Ignorant himself brought to bear on Crass’s work and which he shared joint responsibility for. In recent years, the former unity of ex-Crass members has publicly unravelled. That schism is unlikely to be resolved any time soon – especially as the band’s CDs are now being re-released in the face of opposition from some former members. There has never been any prospect of Crass reforming, and Ignorant’s current tour appears to offer the final opportunity to see the band’s anarchist anthems performed live by any of the ‘original artists’. These shows have not been without controversy. With Ignorant mainly playing commercial venues, charging standard rock ticket prices, and selling band merchandise, some of his dates have been picketed by punks protesting that his actions betray the legacy of Crass. Most of those in the boisterous, excitable audiences at these gigs appear to disagree. Ignorant pledges that, following a final show in London in November, he will draw a line under the Crass experience, and move on to new projects. He might find less closure than he expects. Debates about the merits of anarcho-punk are likely to pursue Ignorant long after he settles into being an angry older man. My review of Steve Ignorant’s autobiography The Rest is Propaganda (London: Southern Records, 2011) appears in the 16 July 2011 edition of Freedom (Vol 72, No 14). I’ll publish the full-text of the review here in a few weeks time, once this issue of Freedom is no longer current.